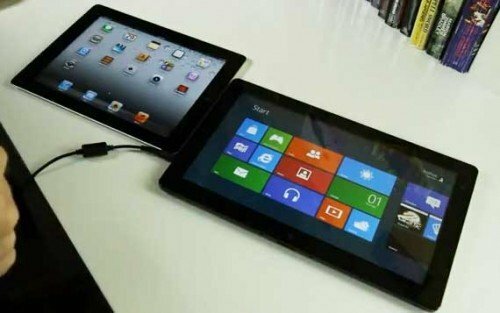 The Verge has a pretty outstanding comparison video between Windows 8 on a tablet and the iPad 2. In the video, you can get a sense just how intuitive it is to swipe around on Windows 8. While there are still some bugs to work out – certain images in the browser didn't appear as they were supposed to and a glitch makes it near impossible to save images from a website – the overall picture is that Windows 8 will be a very strong competitor to iOS — and Android. As you can see in the video below, one of the most outstanding features of Windows 8 is the ability to truly multi-task. You can "snap" your GMail inbox into the leftmost part of the screen so you can easily check e-mail while you surf the web. You can then "snap" other apps into place next to that one. A swipe from the top of the screen dismisses apps and returns you to the home screen, while swipes on the bottom edges also have actions associated with them. But swipes aren't the only thing that's impressive about this update. It's also got an arguably superior search system, and an attractive tiled mosaic homescreen. Whether you appreciate a mosaic look more than rows of apps comes down to personal preference, but I have to say that a mosaic design can certainly show-off a lot more information. It may not be as minimalist as the iPad but it's damn helpful. Of course, a huge selling point is the fact that this baby can run Windows programs, and you can use it as you would a desktop. The iPad can't do this – and never will. Neither will Android. As far as the app ecosystem is concerned, Microsoft is aggressively advertising their Windows 8 platform to developers as a more lucrative way to market their newest creations to the public (they're offering them a better 80 / 20 revenue sharing plan right now). In other words, Windows 8 is a real threat to Android – and maybe even iOS. I thought it performed much more intuitively in the video below. We'll be following their development very closely. Sorry, I don't feel the same. The windows tablet, or whatever they are calling it, is going up against older technology and acting like it is a great thing. if they anticipated the future of other competing products, then I, and probably millions other people, will be excited about it. Rumors should make the competition work harder to produce better products earlier. I hate hearing about products months in advance and then seeing it release with inferior specs. Look at Samsung. Galaxy s2 has a shelf like of 6 months and Galaxy s3 will be old in April? Wow, windows 8 smacks the ios in the video. Seems so much more natural. Sadly, this could be major competition to our beloved Android. iOS seems archaic in comparison.